Thank you Cees! 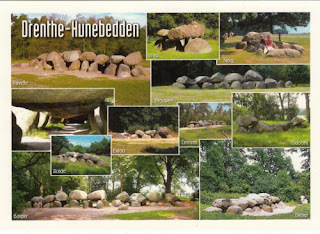 A personalized stamp of a photo of Dolmen 18, near Rolde, in the province of Drenthe. Located near a medieval church, this, and the nearby D17, were once for sale. The government purchased the land in 1873, after public outcry for their preservation. Close up of his self made D18 stamp. Thank you Ellen for this postcard! D18 is on the left in the third row.